I was stunned to hear of the passing of Jean Simmons, because she’d been on my mind over the past week (I’d just seen her in Black Narcissus (1947) and The Actress (1953)). 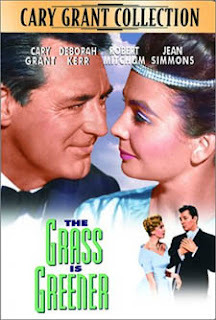 Over the past couple of days, I've been thinking about Simmons’ performance in the comedy The Grass is Greener (1960)—also starring Cary Grant, Deborah Kerr and Robert Mitchum (dreamy cast eh?) When I first saw the movie, I was accustomed to the intensity of her wide-ranging dramatic roles—from her Ophelia in Hamlet (1948), to her dangerously calculating femme fatale in Angel Face (1952), and her drifting, alcoholic housewife in The Happy Ending (1969). I’d always been impressed by Simmons--and something about her wide eyes and the frankness of her voice made her easy to like--but with that adept comic performance, I suddenly adored her. What a delight it was to see the slinky, clever and playful character she created for this movie! As I look back on how many great performances she accomplished—the image of her in that lively role sticks with me. It may not be her best movie, but it is a wonderful testimony to her versatility. And so I will happily remember our dear Jean with a wild headband, glamorous evening wear and bright blue eyeshadow, stealing all her scenes with a wicked grin. R.I.P. Jean Simmons—thank you for sharing your brilliance with us.